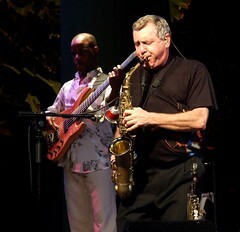 A few nights back I was fortunate enough to attend a performance of the group Spyro Gyra at Jazz Alley in Seattle. I’ve been listening to their work since their first album (remember those? ) in 1975, but this is the first time I have seen them perform. First I want to say I thoroughly enjoyed the show. Their music and style have evolved quite a ways from their early work in the 70’s. Their maturity as artists and desire to stretch what they can do together was evident. While I was awash in the music and watching the band I became aware of a level of collaboration and team-focused performance that I began to mull over concerning how this looks in the world of other teams, businesses and organizations. A lot can be learned from this group. My first impression is that this is truly a group. It isn’t “Jay Beckenstein and Spyro Gyra”, or anything like that….it is Spyro Gyra. They have an identity as a group that was evident throughout the show. This identity showed itself in a number of ways. For me the signifier was that each member was as absorbed in the work of the rest of the band as they were in contributing themselves. There were definitely five talented individuals on stage, but the individuality was clothed in the vision of the music. It reminds me of something I have written on my whiteboard in my office which says, “It’s not about you. It’s not about me. It’s about the music.” This helps remind me of the vision and the goal as I work to accomplish all the things I do while working to keep ego out of it. It’s not easy, but it is worth it.